Hello, I am so glad you stopped by! 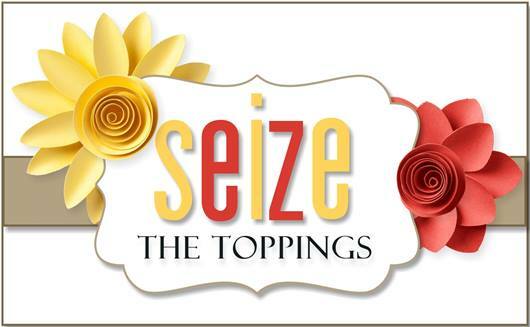 We have a new topping starting over at Seize the Birthday today! The topping is Black and White and was selected by Barbara. I don’t know how you feel about that particular combo of colors, but to me there is always something so striking about black and white. Great idea Barb! My card is very simple and was made with mostly Stampin Up products and a bit of MFT. Please come over and check out what my fabulous team and our guest Julie did this week at STB, it’s sure to inspire you! Categories: Cards | Tags: Card making, Cards, color challenge, Happy Birthday, rubber stamps, stamping, Stamping Up | Permalink. What an elegant die and an elegant looking card with the black and white. I love it. Or is that a stamp. You did not say but no matter it looks awesome. Gorgeous, Nancy! I love the dry embossed hearts along the borders as well as that pretty floral heart. Beautiful card Nancy. Love the embossed background and that lovely floral heart image. It is so elegant! Love that intricate floral heat and those cute embossed hearts in the background! Totally love it! Black and white is so classic and elegant, Nancy, just like your card. This is by far the best one of the challenge. I love the texture on your background and the scalloped edges framed with the black. That heart is so elegant and every time you use it, I think that I need to have it. It’s amazing to see how elegant and lovely a card could be with only black and white! OMGOSH! I LOVE your card! So beautiful and Elegant!! Using White & Black only really give this card a nice classic look! This is so elegant, Nancy, and I love the heart embossed background. This is so beautiful & elegant! Love that the background texture goes with the floral heart.